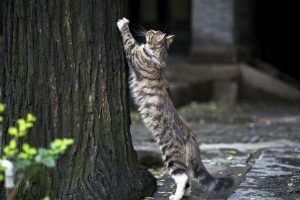 Most cat owners have good intentions when they make the decision to let their cat have free run of the great outdoors, but we want to make you aware of the risks associated with an outdoor cat and this practice and how to avoid some of them. Here at Oakland Veterinary Referral Services, we recommend cats live indoors only, or spend only brief periods outside, protected by a fenced-in yard for their own safety. Because we understand and respect that many of our readers and clients believe differently, we would like to offer our advice for keeping those footloose outdoor kitties as safe and comfortable as possible. Leave plenty of fresh water outside at all times. Place ice cubes in the water to cool it and encourage your cat to drink more. If kitty has an outdoor bed, be sure it is placed in a cool, shaded area. On hot days, wipe a damp towel over your cat to keep her cool. Brush kitty every day to allow air to move freely through his or her fur and remove dust, mats and debris. This is especially important for longhaired cats. If possible, bring your cat indoors during the hottest part of warm days, usually 11:00AM to 4:00PM. Keep an eye on your cat during the warmest days, and bring him or her to your veterinarian if you observe any of the signs of overheating or heat stroke (excessive panting, drooling, vomiting, lethargy, dilated pupils). Make sure your cat is current on all vaccinations. Administer a monthly flea, tick, and heartworm preventive to your cat, year round. Keep your cat indoors overnight if possible. If they stay outside, make sure they have a safe place to retreat to in case of danger. Have your cat microchipped, and make sure the chip is registered and updated any time you move or change your phone number. Make sure your cat is wearing a breakaway collar with current ID tags at all times. Have your cat neutered or spayed. Not only will you be preventing your cat from reproducing, neutering and spaying can help with certain undesirable behaviors such as roaming, fighting, and spraying. Our tips are aimed at helping you keep your animal companions safe and with you for as long as possible. 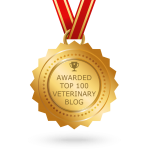 In case of an emergency, though, know that the emergency and critical care staff at Oakland Veterinary Referral Services is here for you day or night.